Highlights: Lake Arenal crossing, Eating like the Locals. We left the mountains around Monteverde via windy and rocky roads. The private van ride provided some stunning scenery along the way. 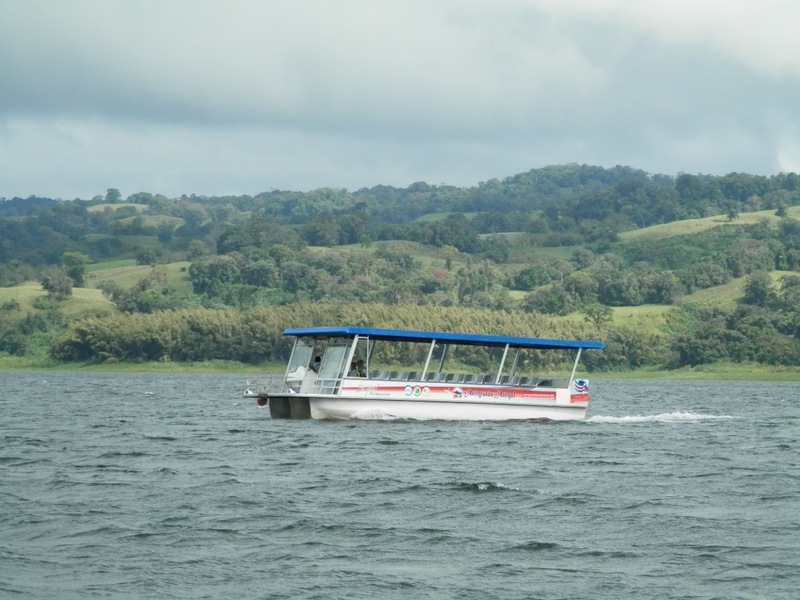 The boat ride on Lake Arenal was very different in that we boarded from the shore not from any kind of dock. Taking luggage down to the shore wasn’t say for those with wheelie style bags. The lake itself is artificial created by a hydroelectric dam. Apparently the win can get quite strong coming off the Caribbean Sea but today there was little evidence of this. At the conclusion of our 40 minute ride we again had to carry of bags up and embankment, no dock once again but no problem for myself with my backpack. La Fortuna is a jumping point for a large number of possible activities so we visited a tour operator not longer after arriving.v We learned that it would be possible to undertake White Water-rafting on the day we are leaving to go to San Jose. This left us with the opportunity to do another activity tomorrow instead for which I decided to do an all day visit to a wildlife refuge however I was the only one selecting this activity. For lunch Gabo took myself, Anna, Laura, and Brigid to an eatery with cheap local food. In my case this was rice with mixed chicken and salad with a pineapple drink. I was to learn that pineapple is a major export for Costa Rica. Later on I organised for a much needed haircut which cost about $5 USD and included a head massage :). Walking back from the town to the hotel I found it a little hot but that was easily solved by a swim in the hotel pool and using air-conditioning. This place is much better than a basic hotel. In the late afternoon I helped out Gabo with a video presentation he is putting together so that was a little different. He is a great guy and an excellent tour leader. On a different note today is Australia Day not that I did much for this day unlike Brigid who wore and Australian t-shirt for the occasion. HAPPY AUSTRALIA DAY.